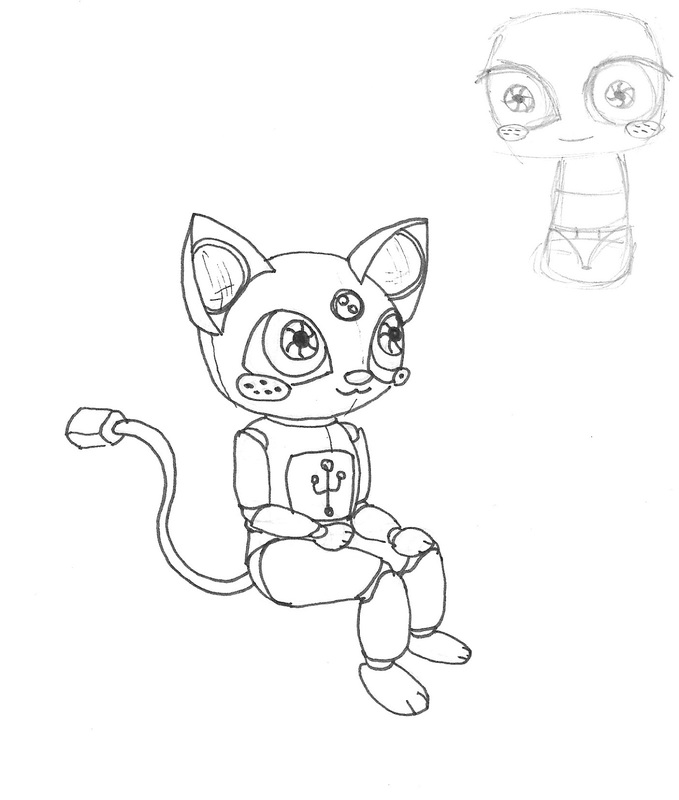 Thought about Futrama robots, Chobits, Questionable Content and a lot of the other robots I have seen in stuff. Then I thought about the things I would want in a robot... a companion, able to get on the internet, give me the weather, my to do's, answer basic questions, call my contacts, take photos, record and transmit my voice, be a passable speaker, and then of course be companionable, portable and cute. Pretty much what my iPhone already is, even though I'm still working with the 4th gen. But that last bit is what I would really want... CUTE. Robot-ish, ya know. Like for real. Android style. So here is my design for a robot that I would want. Something with limited motor skills. Flash drive full usb connector in chest and storage. Ears are speakers and removable to be headphones too. Super big eyes for capturing photos. The shiny forhead "gem" is a lens for being a mini projector. Face blushes are microphones for voice calls and commands. Body poses like an artists doll to allow stable projection and act as a tripod for the camera features. Tail is mini usb for charging from computer or connecting to peripheral devices. And it is cute. I figure it might not be able to walk but would at least be balanced enough and heavy enough to ride on a shoulder, be attached to a backpack or purse or fit in a large pocket. Size wise then it would be about 8 inches tall. Powers for Good, Mr. Skeesbear!